Earlier this spring, Mandy's back started to bother her again. At first we thought that she might need to be more consistent about wearing the lifted shoe, but when that didn't solve the problem we took her in to the orthopedic doctor for another checkup. We got bad news: her damaged leg has continued to grow. Now the difference is between two and three centimeters. That's quite a bit. X-rays of her lower back showed that the discrepancy in leg length has caused her pelvis to rest sideways, causing a 'functional scoliosis' in her lower back to make up for it. 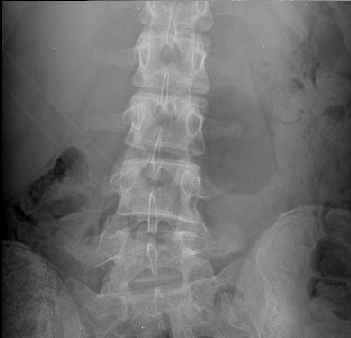 An x-ray taken from the side shows that her lower back isn't curved as much as it should be. This is because, the doctor says, her back muscles are in spasm. That was the GOOD news from the x-rays. The BAD news was that, on the film, the doctor saw something he called a 'nodule.' He asked that we come back the next week to have an MRI done. Mandy's regular doctor agreed that the expensive test was justified, so she and I spent a pretty Friday afternoon at the doctors' office. And then there was a wait for the data to be interpreted and to get back in to see the orthopedic doctor. The MRI report included phrases like degenerative disc disease and severe loss of disc height and severe disc desiccation. That 'nodule' that her doctor had seen on the x-ray is a Schmorl's node. A little research gave us more scary phrases. Significant deformity. Protrusion of the disc material onto the vertebral body. A week later, we've settled uneasily into a big rigid back brace and some prescription pain and muscle medicine and the purgatory that lies between finding out what's wrong and finding out how to fix it. I've gone from planning summer camping trips to planning appointments at Children's Hospital for second opinions from their orthopedics and neurosurgery people. Worse, Mandy's gone from daydreaming about a summer of playboat loops and slalom racing to just trying to get through the school day on as little pain medicine as she can. We know it's just an injury. We know it could be much worse. But right now, today, it's still pretty overwhelming.